Just thinking of Italian picnic food is normally enough to set my stomach rumbling. Planning a whole Italian picnic menu will normally reduce me to a slobbering mess. If I had to choose one cuisine that I thought had absolutely nailed the whole ethos of the picnic it would be Italian. The food is made to be shared. It is the true embodiment of hearty, fresh produce that you. And your nearest and dearest can come together and share with one another the pure enjoyment of the whole theatre of Italian cuisine. From the many cured meats to the beautiful array of wines, Italian picnics may possibly be the best thing you have never done. So let me help you a little with some ideas and suggestions that will put a bit of authenticity into your picnic. You will find some salads, some dips, a whole lot of meats and a basic rundown of available wines amongst other things. Reading some of the other country theme articles you might have gathered that I love a salad with my picnic and Italian picnics are no different. With Italian picnics, I do tend to stay away from your more classic green salad however and steer more towards pasta salads. This is because firstly I want a pasta dish but maintaining hot pasta is troublesome so a cold salad is pretty much ideal. Secondly, there tends to be a crossover of ingredients that I would normally utilize in an Italian green salad such as the cold meats so a pasta salad helps maintain some clarity and direction in the menu. You are possibly thinking that a pasta dish as a starter may be a touch too heavy as a first course for your picnic and you would be right up to a point. 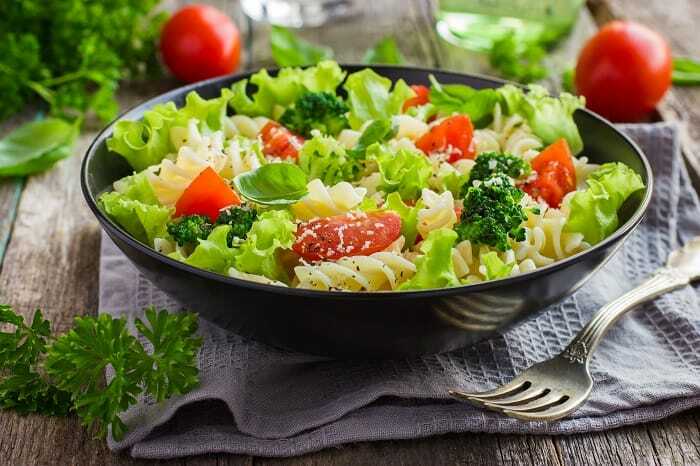 There is no doubting that pasta can be very filling especially if you’re using some larger varieties such as penne or rotini but a little portion control will set you straight. This course is only meant to set you up for all the goodness ahead so a portion around 1 cup would seem a reasonable amount for you to consume. There are many pasta salad recipes available for you to use but what I would suggest is having some good quality olive oil and some Parmesan, fresh if available but pre-grated is fine if this is not possible. We would normally be labeling this section as appetizers or finger food but antipasto manages to reflect both these terms at the same time. Meaning literally before the meal, antipasto is generally the very first course in a formal Italian meal. As we are in a picnic setting though we can pick and choose at which point of the meal we would like to enjoy the many wondrous items that make up this course. Included in normal antipasto courses are things such as olives, cured meats, cheese, and assorted preserved vegetables to name a few. I would like to take a little time to tell you about some of the more prominent items in a bit more detail. Olives – I’m sure it will come as no surprise to you that Italy produces some of the best olives in the world. From the quite frankly huge Cerignolas to the purple Gaeta variety the range is vast and almost all are ideal picnic snacks. Perhaps the best of the bunch is the instantly recognizable Castelvetrano Olive. This bright green olive offers a meaty bite that will leave you with a fresh and mild flavor. Cheese – We are big fans of a cheeseboard here at Go Shindig so we love to get ours out for a bit of antipasto. Italy offers a real medley of possibilities when it comes to selecting a cheese. Softer cheeses include Mozzarella di bufala, Robiola, and Gorgonzola whilst the firmer varieties include the world famous Parmigiano Reggiano, Bigio and Pepato. Use this link to see what cheese you think you might like and take a trip to your nearest specialist deli. Cured Meats – In much the same way you can put a cheeseboard together you can also use the same procedures to put together a board of meat. 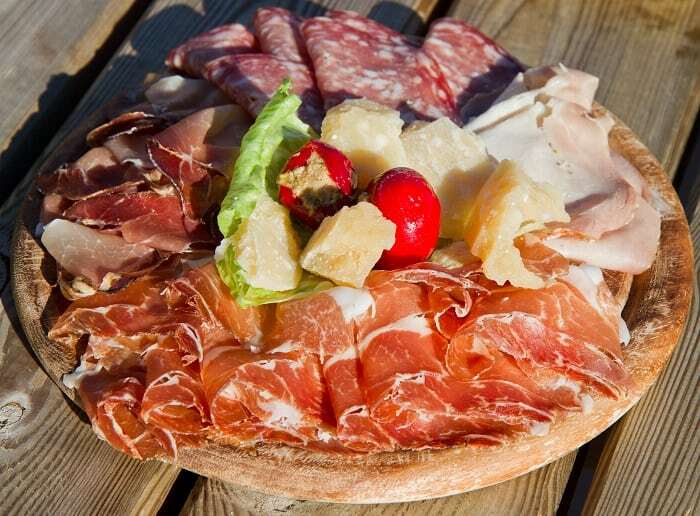 Known as a charcuterie board you can probably guess that it is French in origin but even so the Italian picnic is an ideal time to try this with friends and family due to the number of region specific meats the Italians have. Favorites of mine include prosciutto which is thinly sliced, uncooked ham. Speck is a smokier version of prosciutto and tastes divine whilst meats that have a more salami character include sopressata and coppa. However, I must urge you to try, if you haven’t already done so, some spianta. Not for the faint hearted, this salami is made with lean pork meat and is seasoned with chili that may or may not blow your tastebuds off. Breads – If you’re wanting a little more sustenance to pair with your cheese and meats there is always bread willing to lend a hand. Italian bread is varied like most of their cuisine but as a suggestion, I would stick to just a couple of varieties. Ciabatta is distinct and yet familiar at the same time. It can easily be used for the purpose of a sandwich or just as easily to form part of a bruschetta. It is exceptionally nice with a simple sprinkling of salt, pepper and olive oil. The second bread I would try to have is a focaccia. This bread is topped with differing ingredients dependent upon the recipe but you will most often find olives, onions, herbs, and tomatoes adorning the top. I thought I’d give these deep fried delights a section of their own because, well they’re absolutely delicious, but also they don’t really fit into the antipasto section. I came across these when I was in Malta but soon learned of their Italian origin. They are basically risotto balls that have been covered in bread crumbs and deep fried. Think Scotch eggs but with rice. There are variations as you would expect but all varieties follow the same basic procedures when made, it is just done with different ingredients. Arancini are a way to get a few of the food groups into one snack with an example of one that could contain rice, mozzarella, pistachio, and chicken. They are really easy to make but you might want to invest in a mold for that authentic Italian appearance. 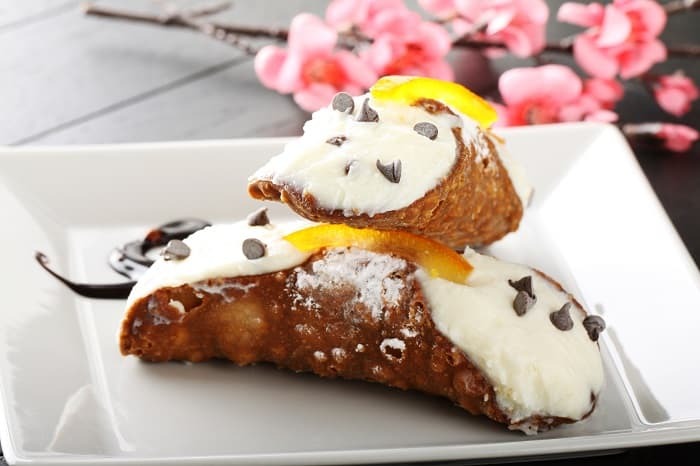 Cannoli – Who knew fried pastry and cheese could be the most beautiful of desserts. Cannoli hails from Sicily and it would probably take a few of the local residents to get between me and a taste of the sweet sweet tubular magic snack (as I like to call it). If you’re feeling lazy or you want to pipe in the filling on site to save on possible mess you can buy some very good shells here. Crostata – An Italian pie which normally has a fruit based filling. Pies are easy to make and are the ideal picnic dessert. Keeping a tub of cream on hand is always a good idea in my experience. Check out this recipe for a beautiful peach crostata. Panettone – If the above has not filled you enough and you really need that fit to explode feeling that accompanies all good Italian meals you might want to finish off with some panettone. It is basically a sweet bread that contains fruit and raisins. It is considered a holiday dessert with it being eaten at Christmas time with increasing popularity around the world. Limoncello – I know I’m one for a touch of hyperbole from time to time but Limoncello is probably the best thing the universe has ever and will ever produce. Being a fan of all things lemon anyway (tarts, cheesecakes, vapes) then there was no way I was not going to like alcoholic lemon. This Italian liquor is most often enjoyed by my friends and me as a shot at the end of a fine meal. Amaretto – Not one of my favorite drinks due to an incident with marzipan when I was very young but still a very popular Italian liqueur. Tastes of almonds and is favored as an after meal drink by many. Frangelico – Another nut based liqueur but this time with a flavor of hazelnut. It can become sickly if you drink too much of it. But for two or three shots this is a delicious taste of Italy. Wine – There is obviously a massive selection of Italian wine with the national output probably only bettered by France. I will cover only the most basic of information for you here in the hope of returning with a more complete list including pairings at a later date. For now, I would suggest either a nice Chianti (red) or Pinot Grigio (white) to complement most things in your picnic basket. Don’t forget about a nice bottle of Prosecco either for those summertime bubbles.